While the U.S. policy shift on Iran saw ATR left with seven aircraft of 20 that could not deliver, it soon found homes for those aircraft, according to Bortoli, who said 2018 deliveries met its target at 76. It proved not a great year for orders, however, as Bortoli referenced the two-year period (2017-2018) in which his team recorded sales for 113 and 52, respectively. That left the backlog at 208 aircraft, representing almost three years of production. Lessors accounted for 16 percent of that figure, Bortoli added. The company's revenue totaled $1.8 billion in 2018, representing continued growth. On the bright side, Bortoli referenced ATR's return to the U.S. market after more than 20 years with four aircraft poised to enter operation with Silver Airways. “We have been able to go back into the U.S. market after a long period–since 1995,” he noted. 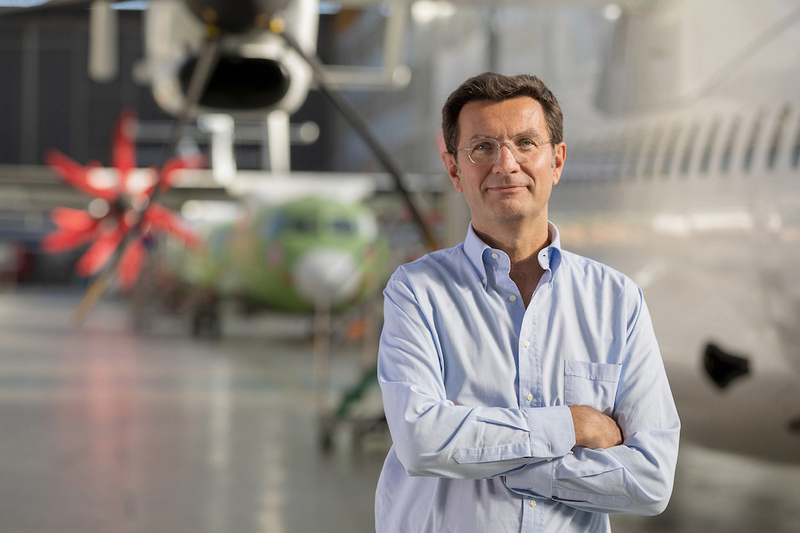 Bortoli described 2018 as “a year to celebrate” for the Franco-Italian manufacturer, half owned by Airbus and the other half by Leonardo. “Regional aviation grew by 3.8 percent in ASKs but ATR has grown by 5 percent–more than the market has grown, while other manufacturers have lost market share,” he said. He also noted the sale of Bombardier’s Q400 program to Viking of Canada at the end of 2018, and that ATR now controls 85 percent of the market in terms of deliveries. In terms of the worldwide fleet, it controls “around” a 75 percent share, and 35 percent of the 35- to 70-seat market, including regional jets. ATR expects the in-development but advancing ATR 42 STOL will lower minimum usable airstrip length o 800 meters (2,500 feet) from about 1,100 meters (2,800 feet). “We're in the latest stages of flying with the prototype to develop the handling characteristics,” said Bartoli. Engineers achieved the improvements, he said, mainly through greater power combined with a modified rudder. ATR also has been working on its pure freighter in partnership with Fedex and on the back of an initial 30-aircraft order. Bartoli noted that some 10 percent of the ATR fleet consists of freighters, all of which were conversions. “We have a lot of interest and a lot of discussions ongoing,” he said. ATR highlighted that it continues to develop the passenger airliner product as well. “We have been continually investing in the improvement of the product; for example, we have developed a new passenger seat with Geven that saves up to 170 kilograms, which is two passengers or more fuel. This has been standard on all ATRs since 2018, while it develops another new seat--the Neo-Prestige--for two-class configurations. The company has also introduced a new IFE system, Cabinstream, that allows passengers to access content on their own portable devices. Another 2018 highlight involved two airlines—Aurigny of the Channel Islands and Druk Air of Bhutan—becoming the launch customers for the new ClearVision HUD system. Finally, Bartoli said the public's image of turboprops relative to jets remained an issue and would represent the subject of a major public relations campaign by the company through 2019 and in the future.